This is a three-in-one portable car-assisted mobile security support handle. It is made of high quality materials. Feel soft and comfortable, light weight and strong. It does not take up space and is suitable for elderly people getting on and off the bus, pregnant women and injured people. This is the best gift of love. Using the handle makes it easier to remove it from the car. The handle is suitable for the vehicle's latch to provide additional leverage and stability. Insert the vehicle's stick into the latch and hold the non-slip handle to support yourself, prevent falling, standing or sitting. When finished, remove the latch easily. Handlebar built-in seat belt cutter. Equipped with a hammer to break the glass in an emergency. Suitable for all doors without modifying the vehicle. [Easy to use]: This is an ideal choice. This is the best gift for those who have difficulty accessing the vehicle and provide good support for any vehicle entrances and exits. Will not scratch the car. Suitable for elderly people getting on and off the bike, pregnant women and injured people use. [Quality Assurance]: Made of high-quality materials, the sturdy, lightweight, sturdy aluminum structure can withstand up to 450 pounds of good support to prevent slipping. 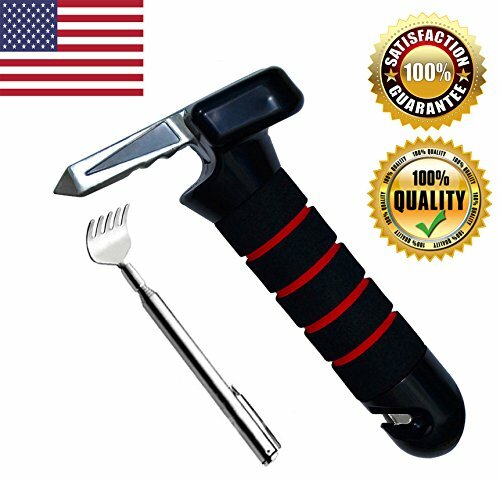 [Multi-function]: emergency escape equipment tools for car seat belt cutters and window breakers. The handle is soft, comfortable and elastic. [Portable does not occupy space]: The compact and practical vehicle standing support assists the grab bar to be easily hung on the door frame or carried around, ready to use. [Sale Guarantee]: 100% Satisfaction Guarantee: If the handle does not improve the problem of getting on and off the car. Or, if you have any quality problems, simply contact us by email and we will replace any defective products for our customers. If you have any questions about this product by MsSmile, contact us by completing and submitting the form below. If you are looking for a specif part number, please include it with your message.